Each job is different, because each client is different. Part of my job is to go over every detail with you to ensure that the budget is established and your needs are being met. We can go as big or as small as you desire. 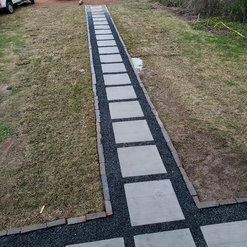 Chris and his team did an awesome job installing underground drainage from back to the front yard, artificial turf, and rock on both sides of the house. From start to finish in less than 4 days. 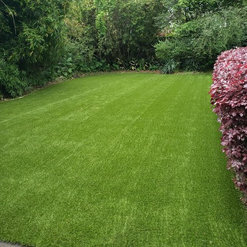 Chris answered all of my questions (and there were LOTS) quickly and helped me to understand the products he was using and maintenance steps of owning artificial turf. The crew were very polite & cleaned up nicely each evening before leaving with a full clean up the day they finished. It was a great experience working with Chris and his crew. I would definitely recommend! Chris and his team repaired a large portion of my yard after I had a gas line installed. He guaranteed his work and stuck to his word. After discovering a soft spot months later, I contacted Chris and he immediately came out the next day and found a leaky sprinkler. The repair was done in 24 hours. Very happy with his professional responsiveness and his work product. I would definitely recommend him to friends. If you want a good quality putting green and want it done right, then Chris Helms is the guy for the job. I found Chris' company out on the web, and just sent him an email one evening. He called me the next day, we set an appointment to which he showed up right on time. He is a real nice guy, and his crew was just as nice. We agreed on a deal, and set a date. He actually started the job early, which was a good thing for me and finished on schedule. Even though I made some changes mid-stream he still stayed on schedule. 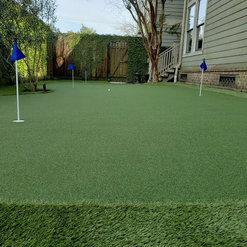 Also after the putting green was cut and laid in place he saw there was an issue with the green ( a defect), pulled up that green and went and got a new one to replace the one with the defect. His crew was excellent, very friendly and very interactive. They talked to me throughout the process about what they were doing and answered all my questions. If I had to do it all over again, Chris and Helms Landscaping would be my first choice. 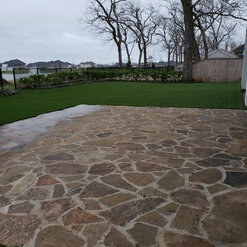 I am so pleased with the whole process and he did exactly what he said he would do... rest assured Chris is your guy if are looking to a green, turf, landscaping... support your local business owner... Chris and his team will make you glad you chose them to do the job. 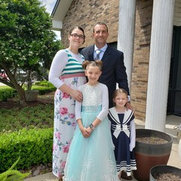 Chris and his crew were extremely prompt and professional. 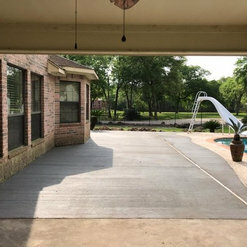 They showed up when they said they would and completed the job on schedule. 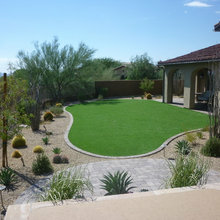 We had a putting green refurbished by Helms Landscape and we couldn't be happier with the result. It looks better than ever. 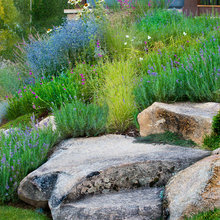 We would highly recommend Helms Landscape Design to anyone and we will definitely use him in the future. Very nice finished product. 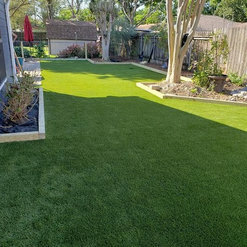 Chris and his team were very professional, fast and efficient, and I was putting on my new backyard putting green in just 4 days! We love it. It’s good for the whole family. We had such a good experience! Chris is super friendly and his crew is awesome. My son got super excited every day when they would show up, they were always really friendly and would wave to him throughout the day as he watched them. They worked hard everyday they were here and cleaned up after themselves. The builders who did our yard originally left all kinds of construction debris under our grass, the crew got all that cleaned up and gone which I really appreciated. Chris has the best prices out of all the bids we got, and our turf looks beautiful. Every part of this process has been great! I can't recommend him enough! 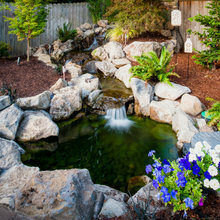 Chris with Helms Landscape Design helped me with a stunning surprise backyard makeover for my husband while he was away on a business trip. 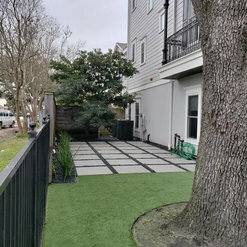 My timeline was short and my budget firm, and Chris was able to meet my deadline and budget, was on-time every day, had a very friendly and respectful crew and cleaned up all the mess at the end, leaving me with a beautiful redesigned backyard! 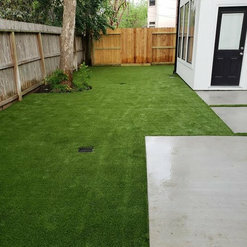 He installed artificial grass (which we love! 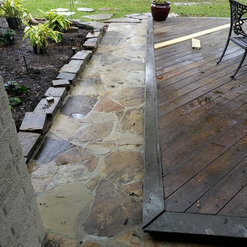 ), plants, bushes, trees, a fountain and even planted flowers for me in my planters around the patio. He is creative and did a great job taking drainage into consideration. 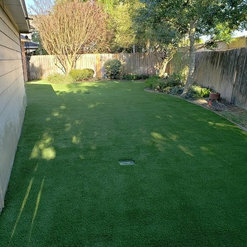 It's been 3 months and our yard looks amazing and all the drainage problems are gone! We constantly get compliments saying our backyard seems like a fancy resort. Thank you, Chris! I would hire Chris and team again in a heartbeat! 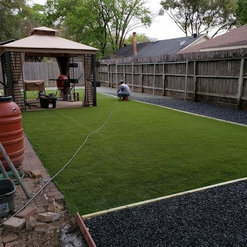 We asked Chris for an almost maintenance free backyard that our dogs would still enjoy, plus address our lack drainage, and he gave us just that! 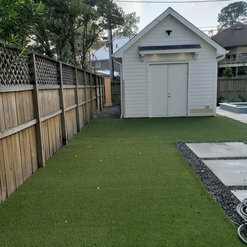 He was very responsive from the beginning, and really took the time to make the backyard we envisioned a reality (and free of standing water after storms). His team worked so fast (3 days! ), and left the place clean so we could enjoy the yard right away. We definitely recommend working with Chris and his team. Helms landscape design was a lifesaver! I had a different individual come out and begin my sprinkler system after putting half of the $ down he kept making excuses for not coming back. I was referred to Helms and he came out next day gave me a price and got the job done day after that. Everything was put in and done so quickly and professionally that I will never think to use anyone else!!! Commented: Paint colorI'm not sure, it was not my home, I just added some plants here.